An eyewitness, who is not being named for security reasons, told the BBC he was spared after saying he was an Afghan. "Where are the foreigners?" they shouted. "The attack on the hotel, once again, shows the depravity of terrorists who seek to sow chaos," Ms Nauert said. "We are grateful for the bravery displayed by the Afghan National Defense and Security forces. Had it not been for their speedy recovery of the wounded, more lives may have been lost. We are in close contact with Afghan authorities regarding their investigation and stand firmly by the Afghan government." The Afghan interior minister said the recent decision to transfer security to a private company had been a mistake. 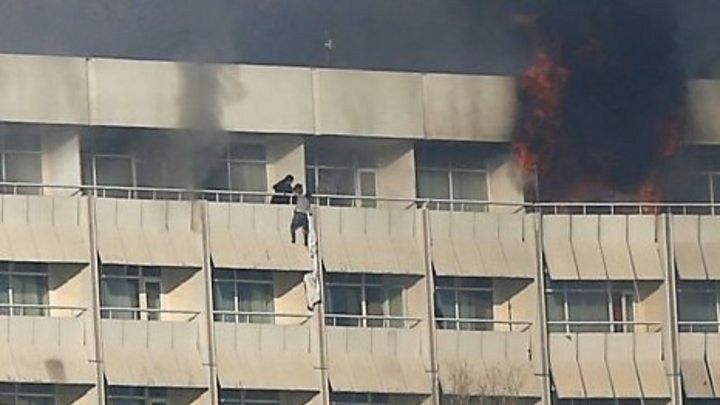 The Taliban, which targeted the hotel in 2011, said it was behind the latest attack. A spokesman said in a statement quoted by AFP that the group had "killed tens of foreign invaders and their puppets". Hotel manager Ahmad Haris Nayab said the gunmen had entered the state-owned hotel through a kitchen. However, there have been several attacks in recent months, including a bomb at a Shia cultural centre last month that killed more than 40 people.